Ideal for converting a DB9 male into a DB25 male or a DB25 female into a DB9 female. Straight-through design. 100% Compatible with all serial devices. DB9 and DB25 Modem cables are available at SF Cable and can be ordered to get delivery at your doorsteps. 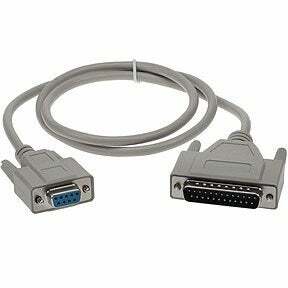 We have DB9 Female to DB25 Male Modem Cables and other products available to meet your requirements. All cables are available in various lengths to cater to different needs. We source the products directly from the manufacturers to make them available at nominal prices for you. We assure you of the quality of the product as all of them are ISO 9001-2000 certified products. You can also expect good after sales service and lifetime technical support on all our products.